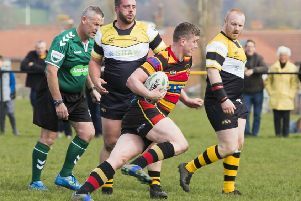 Brighouse Rangers went four points clear at the top of Division Three in the Yorkshire Men’s League with a 40-0 home win over Birstall Victoria on Saturday. In conditions more akin to Brisbane than Brighouse, the home side won comfortably despite resting a couple of players who were carrying knocks. Strength in depth and stand-in coach Terry Moon’s guile off the touchline was more than enough for Rangers to move clear of nearest rivals Elland in the table. Loose forward Jordan Sild scored the first of his four tries in the second minute as he demonstrated the benefits of sacrificing agility for extra timber, rumbling over despite attentions of four Birstall defenders. Veteran fullback Frankland kicked the goal to give Rangers a 6-0 lead. A period of stalemate ensued, with scrappy play from Rangers giving Birstall some opportunities, but an extremely well drilled defence and tenacious tackling from the Rangers lads prevented any score. Debutant stand off Josh Kelly imposed himself on the game, with a perfect kick behind static defenders in the 20th minute, for speedster Lewis Taylor to easily win the race to the ball and score near the right corner flag. Rangers tightened the tourniquet, when Matty Bailey crashed over, Frankland adding the conversion to make it 16-0 in the 30th minute. Kelly again put in a perfect kick for Taylor, his attacking kicks adding an extra dimension to Rangers’ play, but only a last bobble of the ball prevented the flying winger adding his second. Louie Sweeney was proving to be a handful despite his slender frame, and Harry Johnstone ran himself to exhaustion in these early exchanges. Wroot and Wrightson were a constant torment to Birstall. Human wrecking ball Liam Pitman-Smith came off the bench, causing all kinds of damage, but Rangers were unable to add to their tally before the break. Sild bulldozed his way over in the 46th minute and completed his hat-trick in the 55th minute in similar fashion, being impossible to stop at close range. Frankland knocked over the conversions to make it 28-0. Pete Lopag was denied a try in the corner, after being judged to have touched the sideline with his foot. Despite the overwhelming score line, Birstall never gave up, but Rangers’ offered no crumbs of comfort, repelling every charge. At the other end, Callum Heseltine powered his way over near the posts, after prophetically stating that if he got the ball, he’d score. Frankland again converting to make it 34-0. Joe Sealey nearly got a reward for his tackling efforts, but this had clearly taken its toll, and he was held up over the Birstall line by the smallest man on the field. Sild made sure of his fourth try in the 73rd minute though, steam rolling through defenders, Frankland completing the scoring with the conversion. Sild was man of the match for Rangers while Louie Sweeney also caught the eye with his best display this season in a Rangers jersey. The zero points against was a great testament to Rangers’ tenacity and concentration in the sweltering heat. The work rate of three quarters Campbell, Carr, Taylor and Lopag was impressive. Concerns for Rangers were injuries to Eddie Tankard, who also had a fine game, and Ronnie Bailey. Rangers travel to play third-placed York Lokomotive on Saturday.